Parasitic Diseases - body, causes, Where Do Parasitic Illnesses Occur? Parasitic diseases are illnesses caused by infestation (infection) with parasites such as protozoa (one-celled animals), worms, or insects. These diseases are widespread in Africa, southern Asia, and Central and South America, especially among children. They include malaria and schistosomiasis, the world's most common serious infectious diseases. Most of the world's 6 billion people are infected with parasites, which are primitive animals that live in or on the bodies of humans, animals, or insects. Often the parasites do little damage, and people may be unaware they are infected. But in any given year, more than a billion people, many of them children, fall sick with parasitic diseases, and millions of them die. Where Do Parasitic Illnesses Occur? Parasites live everywhere, but they particularly thrive in warm, moist climates. So they are most common in sub-Saharan Africa, the Indian subcontinent, southeastern Asia, and Central and South America. Some nations in these areas are too poor to take measures that could prevent parasitic infections—such as building water and sewage treatment plants, controlling mosquitoes, or providing adequate medical care. At the same time, in some places, parasitic diseases make so many people weak, ill, and unable to work that they slow economic development and help keep regions impoverished. Some parasites are found worldwide, even in cooler climates and in wealthier nations, including the United States. These include pinworms, whipworms, and such protozoa as Giardia lamblia (which causes intestinal problems), Babesia (which is spread by ticks and causes fever and chills), Trichomonas vaginalis (which infects the genital tract of men and women), and Cryptosporidium parvum (which has caused outbreaks of diarrheal illness in some cities of the United States). What Are the Most Common Parasitic Diseases? The intestinal roundworm Ascaris lumbricoides causes ascariasis, estimated to infect 1 billion people, although it often does little damage. More important in its impact is malaria, which is estimated to cause 300 million to 500 million illnesses a year and about 2 million deaths. About half of those deaths occur in children under age 5. Schistosoma blood flukes cause schistosomiasis (shis-to-so-MY-a-sis), which is estimated to cause 120 million illnesses, 20 million of them severe. Other parasitic diseases that are estimated to cause a million or more cases of illness are filariasis, amebiasis, Chagas' disease, leishmaniasis, and African sleeping sickness (trypanosomiasis). "Ecto-" means "outer." Ectoparasites live on the outer surface of humans. They include lice and the mites that cause scabies (SKAY-beez). How Do Parasitic Diseases Spread? In most cases, people get a parasitic infection by bathing in, swimming in, or drinking water that contains parasites; by eating food that has not been cooked thoroughly; or by coming into contact with untreated sewage. That commonly can happen when human waste is used to fertilize fields. It also can happen if people who handle food do not wash their hands thoroughly after a bowel movement. Leishmaniasis (leesh-ma-NY-a-sis) occurs in tropical and some temperate areas. 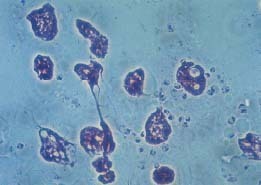 Protozoa (single-celled parasites) in the genus Leishmania cause the disease, which is transmitted by the bite of infected sandflies. 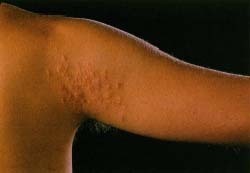 Forms of the disease include (1) cutaneous (ku-TAY-nee-us) leishmaniasis, which causes a painless but unsightly skin ulcer that often heals on its own, leaving a depressed scar; (2) muco-cutaneous (myoo-ko-ku-TAY-nee-us) leishmaniasis, which eats away at the tissues inside the nose and mouth; and (3) kala-azar (ka-la-a-ZAR), which affects the lymph nodes, spleen, liver, and bone marrow and can be fatal. The Leishmania donovani parasite, seen here under an electron microscope, can cause the form of leishmaniasis called kala-azar. © Manfred Kage/Peter Arnold, Inc. Many impoverished nations are undergoing rapid urbanization, meaning many people are crowded together into fast-growing cities that may lack sewage treatment facilities. Raw (untreated) sewage may be dumped into rivers whose water is also used for drinking, bathing, washing, and cooking. Parasitic diseases spread easily in such conditions. Insects and animals spread some parasitic diseases. Mosquitoes, for instance, spread malaria. Tsetse flies spread African trypanosomiasis (tripan-o-so-MY-a-sis), also called African sleeping sickness. Domestic animals spread beef and pork tapeworms. This young man has a skin rash on his upper arm caused by hookworm larvae. St. Bartholomews Hospital/Science Photo Library/Photo Researchers, Inc.
What Happens When People Get Parasitic Diseases? The symptoms vary widely, but many parasitic infections cause fever, fatigue, or intestinal problems such as diarrhea or bowel obstruction (blockage of the intestines). Parasitic diseases can be difficult to diagnose because many parasites do not show up on the routine blood tests that doctors perform. In addition, people with parasites are prone to get bacterial infections as well, which may fool doctors into thinking that the bacteria alone are the cause of the illness. Special blood tests, however, sometimes help with diagnosis. In addition, parasites sometimes can be seen if samples of stool or blood are examined under a microscope. Although most parasites can be killed by proper medication, some cannot. How Can Parasitic Diseases Be Prevented? Public authorities that build sewage and water treatment systems play a major part in preventing these diseases. Controlling the insects that spread some parasitic diseases also is important. So is teaching people always to wash their hands thoroughly after using the bathroom and before handling food. African trypanosomiasis (tripan-o-so-MY-a-sis) is also called African sleeping sickness. Protozoa (single-cell animals) of the genus Trypanosoma cause the disease. African trypanosomiasis is found only in Africa and is transmitted by the bite of an infected Tsetse (TZEET-ze) fly. Treatment for African trypanosomiasis involves a number of drugs administered under a doctor's care over a period of weeks. Left untreated, death eventually occurs. The U.S. Centers for Disease Control and Prevention (CDC) has a Division of Parasitic Diseases (DPD) that posts fact sheets about many different parasitic infections at its website. The U.S. Food and Drug Administration's Center for Food Safety and Applied Nutrition posts a Bad Bug Book at its website with links to many different fact sheets about parasitic protozoa and worms. The World Health Organization (WHO) posts a fact sheet about parasitic diseases at its website. Where or Who can give you a proper diagnosis and required tests for above parasitic diseases? Most Physicians and Dermatologists neglect listening to their patients & avoid Guidelines to proper diagnose their patients! Therefore, the patients end up going through unnecessary stress, pain, humiliation and declining health!